Nanning’s 1st Farmer Spring Festival Gala themed with “Working Hard to Realize Chinese Dream in the New Era” was held in Guyue Village, Nanyang Town, Qingxiu District, Nanning City on the night of January 11, 2019, aiming to celebrate the 70th anniversary of the founding of the PRC. Farmers from all districts expressed their happy mood and their love for their hometown’s culture through elaborate performances, which fully showed the happy life of farmers in the new countryside in the new era. 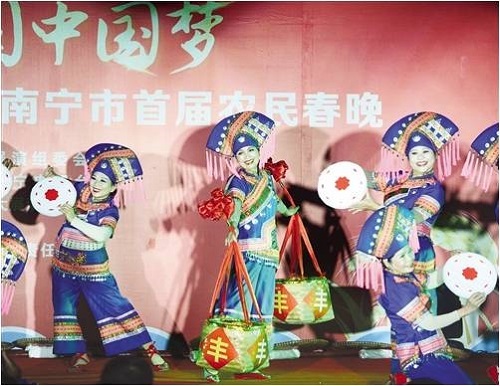 As one of the major activities of the 9th Nanning Village Community Harmonious Art Performance, the gala is sponsored by the Organizing Committee of the Nanning Village Community Harmonious Art Performance, and co-organized by the Publicity Department of the CPC Qingxiu District Committee and Nanning Television. It has been declared as “Our Chinese Dream” Culture Entering the Masses Activity and Nanning’s New Year Activity in 2019.